Here’s another chance for people who missed out on Wildwood Spirit’s limited release of Dark Door bourbon earlier this year. The bourbon, aromatic with the flavors of toffee, caramel, orange flowers and vanilla, has been marvelously handcrafted with locally-sourced WA corn, and aged in rare, artisanal oak barrels for maximum wood-spirit interaction. “We relied on the barrels to add lots of oomph and character to the bourbon, and we couldn’t be happier with the results,” says Erik Leidholm, head distiller at Wildwood Spirits. 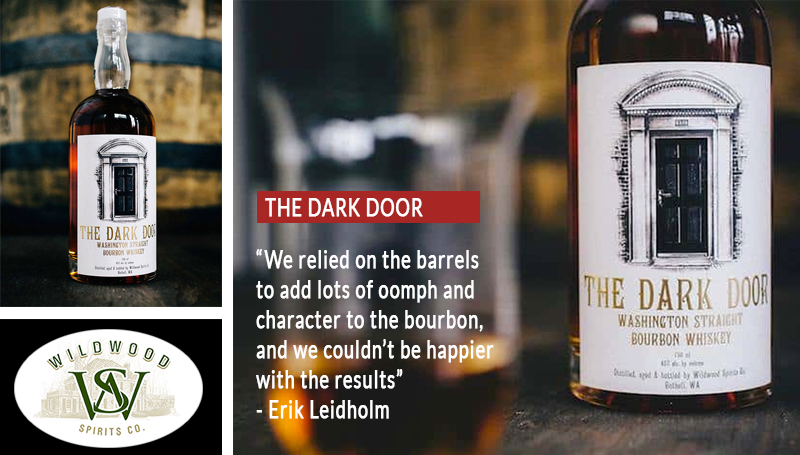 From the 12 barrels of Dark Door he produced, Leidholm expects 300 bottles from each barrel. The first 3 barrels that were released are already sold out but Leidholm held some back some from each, so he could release a sample of 4 different bottles from 4 different barrels just before the Holidays. So if there’s a bourbon connoisseur on your Holiday shopping list this year, someone who would value such a rare and special gift, make sure you don’t miss out on the vertical release on December 15th. Call 425-286-1102 (from Wednesday-Sunday between 2 pm-7 pm) for more information. Wildwood Spirits is located at 19116 Beardslee Blvd. Ste 102, Bothell, WA 98011.